No matter the season, I love a bowl of soup for dinner! There’s something about the warmth of a soup as it travels down to my belly that makes me happy 🙂 And since it’s summer and the heat is kicking here in Austin, we’re turning to a soup that is great hold or cold, and satisfies our need for coconut oil and yummy fresh veggies. This is a vegan friendly recipe too as it omits butter or cream and relies simply on the squash and sweet potatoes for the thick, creamy consistency. Below is one of our fave recipes, and you can play with the topping suggestions until you figure out your fave dish. We love lightly toasted walnuts or almonds for a nice crunchy/salty treat. Garnish with bacon, chives, walnuts or hot sauce if desired. looks great! we make butternut squash soup often since my kids love it too but we’ve never used sweet potatoes too. thanks for the suggestion! Thanks Janet! They definitely add a sweet touch to the soup that the kids love too. Enjoy! The potatoes aren’t ideal on a paleo diet, but if you allow for a cheat meal or follow the Primal Blueprint diet they are ok. All in all, I think it’s important to have the occasional cheat to keep you on track the rest of the time. And if a healthy option like this is a “cheat” then I think we’re doing allright 🙂 But if you’re following Paleo to the book, then omit them and add a touch of stevia if you prefer the soup to remain a touch sweet. Let me know how it turns out! How do you cut the squash when it's so hard? Hi Bailey – that’s def my least fave part about cooking with squash (which I do a LOT). I use a large chopping knife, starting at the smaller end and cutting straight down the center. It’s not easy and you have to be careful while picking the knife up and working it down again. Make your way along to the fat end of the squash and once you have cut a line all the way long the squash you can stick the knife straight down in the middle of the line you cut (in the center of the squash) and sort of pry it open. I hope this helps! 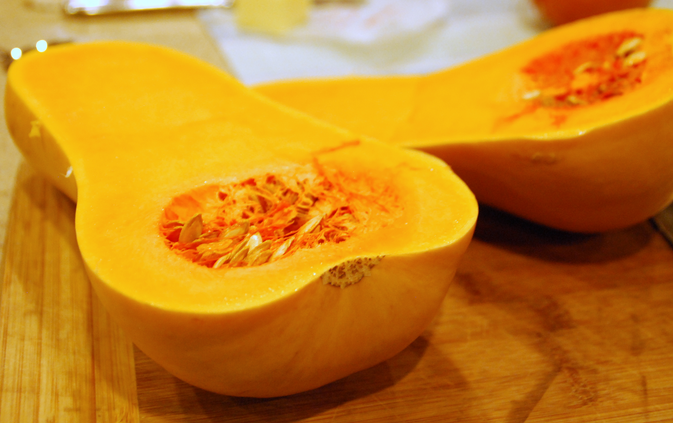 10 Pings/Trackbacks for "Paleo, Gluten & Dairy-free Squash & Sweet Potato Soup"